‘Time flies when you’re having fun’, or so the saying goes. 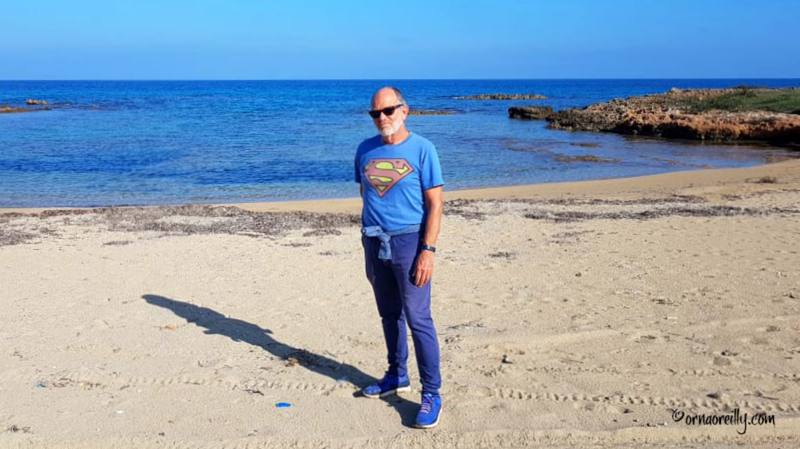 It must be true, as I can hardly believe that, in the blink of an eye, Tom and I have been living in Puglia for more than two years and have just headed into our third winter down south on the stiletto heel of Italy. And we have certainly been having fun, with quite a few surprises, since we moved here; some surprises have been good, some not so good. Not everything here in Puglia is what we had been expecting. First of all, the climate is not as mild as we had expected and winters are quite a bit chillier too. Most of the time, it’s much milder down here than it is up north in the Veneto, where we lived previously, so when cold weather arrives it’s always a sudden shock to the system. Take November, for example. Up until the middle of the month we were out walking in short sleeves. Then, within just a few days, we were reaching for our down-filled puffer coats in order to go out for the evening. 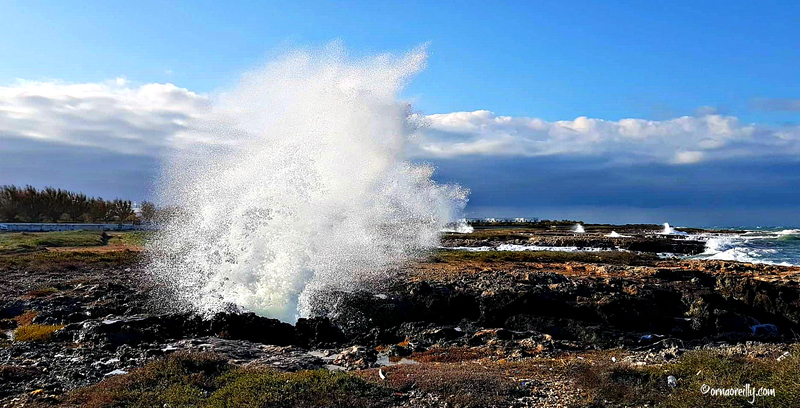 Now, in early December, it’s sunny, breezy and cool; perfect walking weather during which I love to head for the coast, just twenty minutes’ drive away, for lovely long walks along the seashore. The humidity that arrives annually in October and November was another shock. Heralded by autumnal sea mists which the olive trees love so much, blue mould, or ‘muffa’ as it’s called here, arrives annually. Early on, we rushed out to purchase a dehumidifier. Funnily enough, when I went to the dump in Ostuni to drop off the packaging, an Italian lady stepped from her car at the same time and was dropping off an identical box. So, as we smiled knowingly at one another, I knew I was not the only person with this problem! Now we’re into our third winter and having to treat yet another blast of ‘muffa‘ all over again. It appears to be an annual event and an annoying one too, but we are learning how to manage it. Our first snow arrived in early January 2017. This jolted us to the core, as we hadn’t been expecting any such thing. 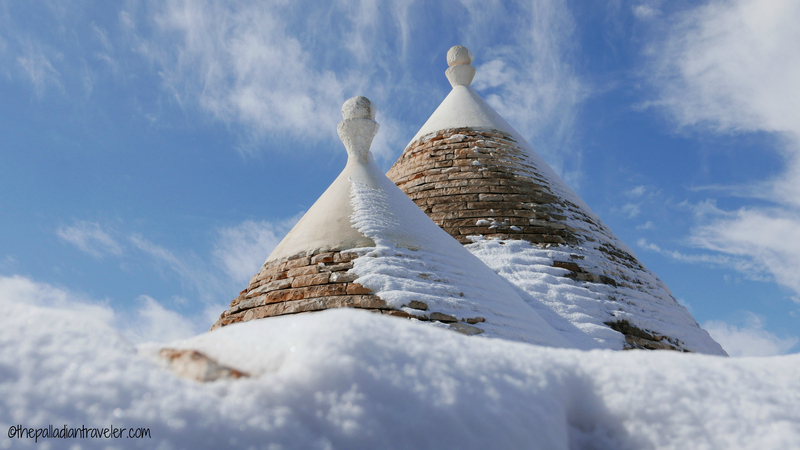 It snowed again this year at the end of February, when ‘The Beast from the East’ hit Puglia just like everywhere else and temperatures plummeted to minus 5 degrees Celsius. Mind you, the snow, on both occasions, lasted for barely a day and promptly disappeared. 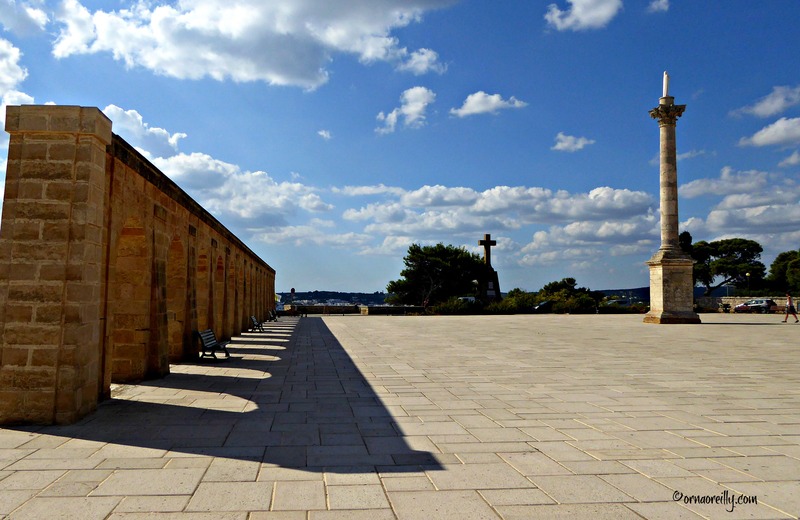 Our area of Puglia, perched on the edge of the Murgia Plateau, is spectacularly beautiful. 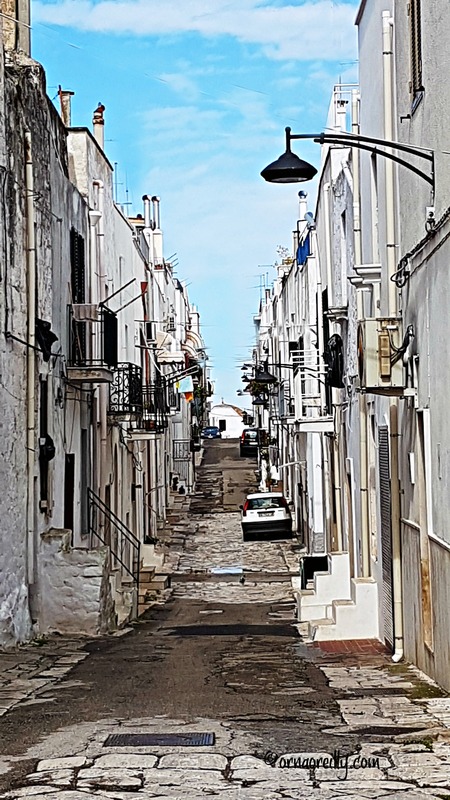 There are picturesque towns all around us, within touching distance: Ostuni is closest at 6 kms and Cisternino, one of the ‘Borgo piu Belli d’Italia’ (most beautiful towns in Italy), is just 8kms in the other direction. We are positively spoiled for choice. Then there is the lovely town of Martina Franca, the highest town on the Murgia plateau..
Alberobello, the famous UNESCO town of 1,500 trulli is just over half an hour away, as is Locorotundo, yet another of the ‘Borgo piu Belli d’Italia’. Locorotondo. Traditional Cummerse style house. And Ceglie Messapica – known as the town of restaurants – is barely twenty minutes away. As we live on a peninsula with the Adriatic and Ionian Seas close by, I love the town of Gallipoli on the Ionian side. 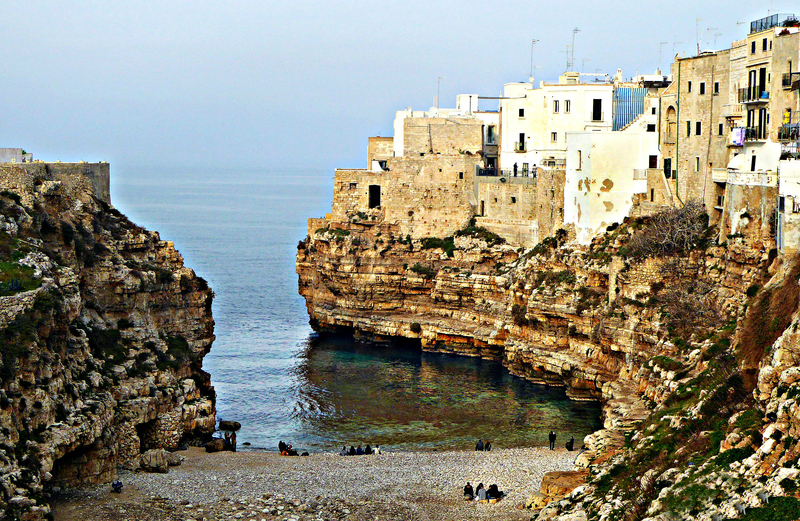 Back on the Adriatic coast, just south of Bari is the spectacular clifftop town of Polignano a Mare…. 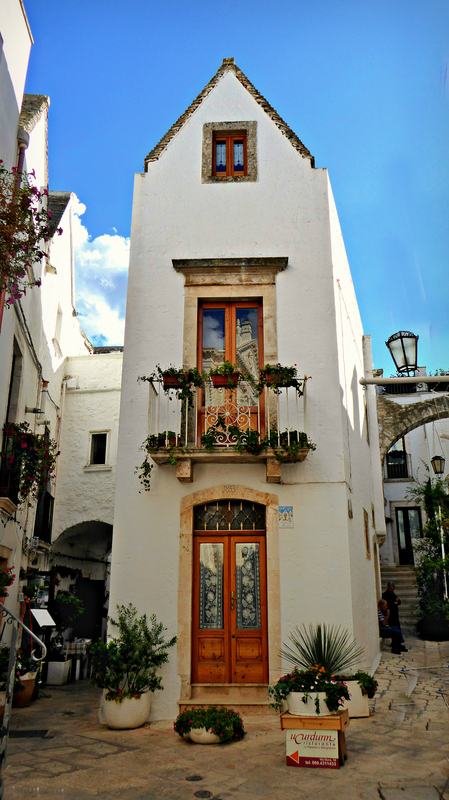 …..heading south there is the coastal town of Monopoli…..
…Torre Canne…. 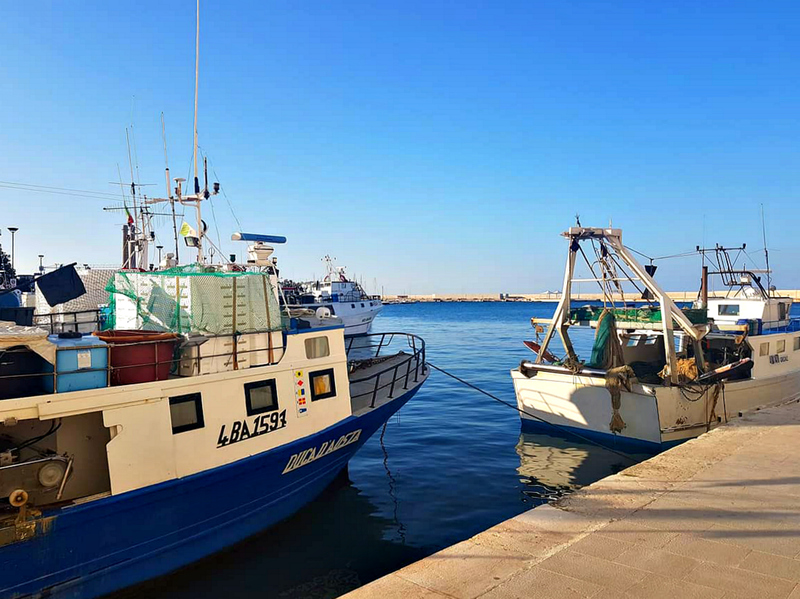 .and further south along the coast…..
….then on down to Santa Maria Leuca, where the Ionian and Adriatic Seas collide. 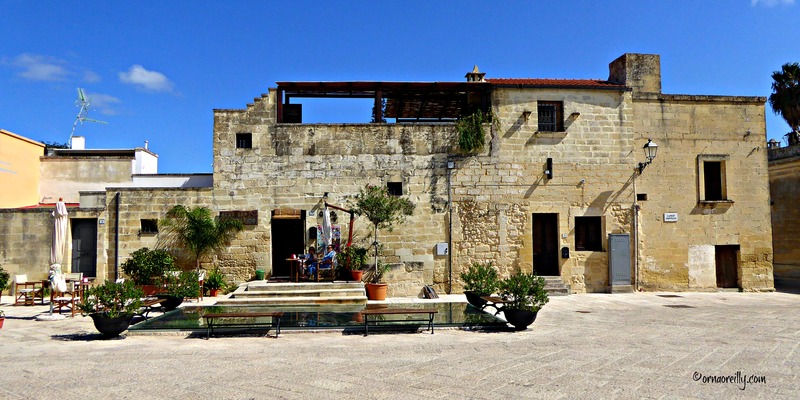 Just one hour by train from Ostuni we arrive in the Baroque city of Lecce…..
…and near Lecce there are quaint villages like Castello Acaja to explore at leisure…. 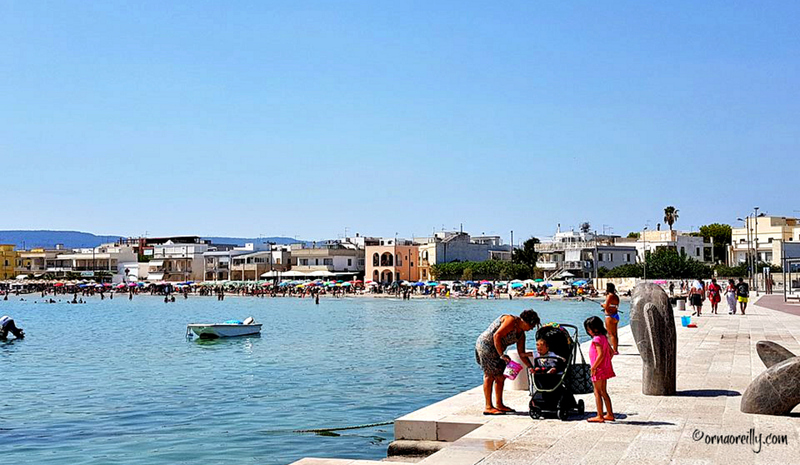 ….quite apart from the myriads of pretty little towns like Savelletri, which dot the coast. The city of Brindisi and its international airport are 40 minutes south and the city of Bari is a little over an hour to the north. As regards our daily life here, it takes us not much more than fifteen minutes to drive to the Ostuni coast at Villanova where we can walk for miles in winter barely seeing a soul. We also love to walk through the olive groves which surround our house and are a true feature of Puglia, the largest olive growing area in Italy. 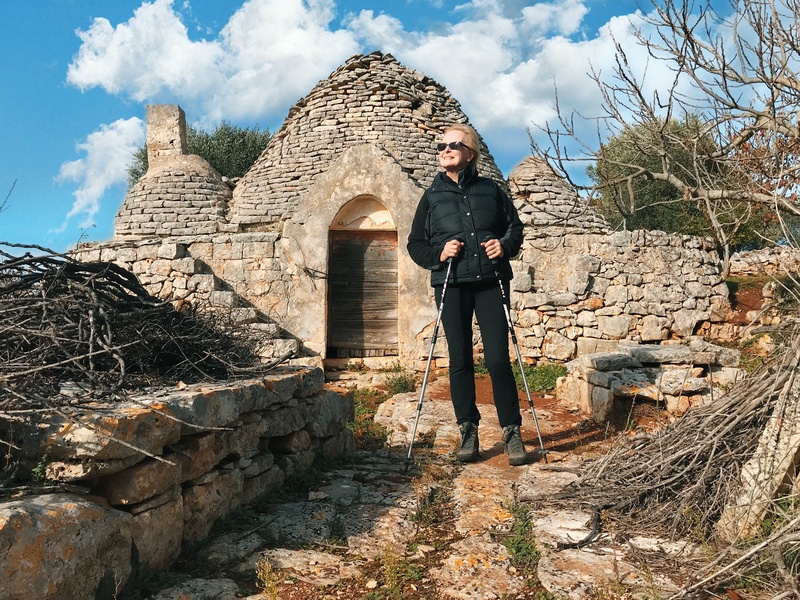 Our walks take us past many trulli, many renovated and even more derelict, their little cone-shaped roofs peeking out from the olive groves. Shopping at the local Famila supermarket is easy. It’s modern and well stocked with all our favourite foodstuffs. Entering our local Famila I am greeted by a myriad of fruit and vegetables, virtually all local and in season. The smell of freshly baked bread wafts towards me and I temporarily forget about boring things like carbs as I buy a piece of Altamura bread with its dark crusty exterior – perfect for a lunchtime bruschetta. Counters are filled to bursting with umpteen varieties of cheeses and meats. The well-stocked butchery sells ready-made bombette – a Pugliese speciality consisting of rolled balls of meat, usually wrapped in pancetta and filled with delicious gorgonzola or caciocavallo cheese – and wonderful sausages seasoned with finocchio (fennel). Quite apart from the banquet of beef, pork, lamb and chicken that greets us on our trolley-pushing expeditions, there’s the fish counter with fish so fresh it’s virtually flapping around, plus a freezer section full of frozen gamberi (prawns), merluzzo (cod), platessa (plaice/flounder), orata (sea bream), triglie (mullet) and spigola (sea bass). Organic and gluten free produce; whatever you need. It is said that Puglia has possibly the healthiest food in Italy. Apparently, the diet is the true Mediterranean one. 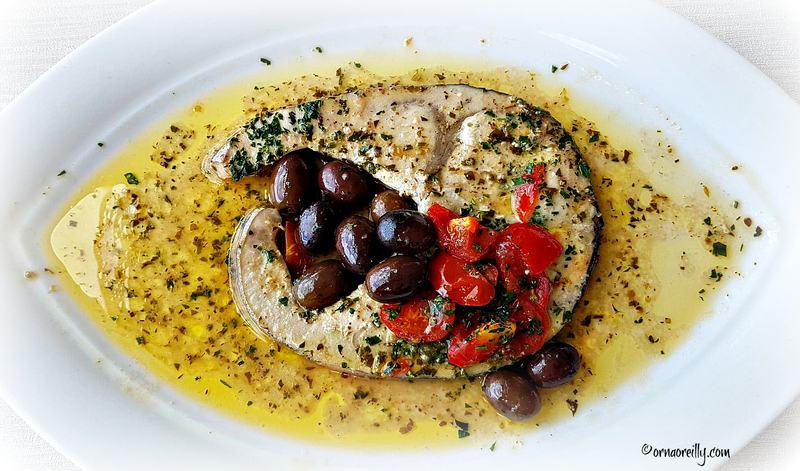 Feast your eyes on this piece of perfectly prepared swordfish. The area close to our house is sprinkled with a wide variety of restaurants. 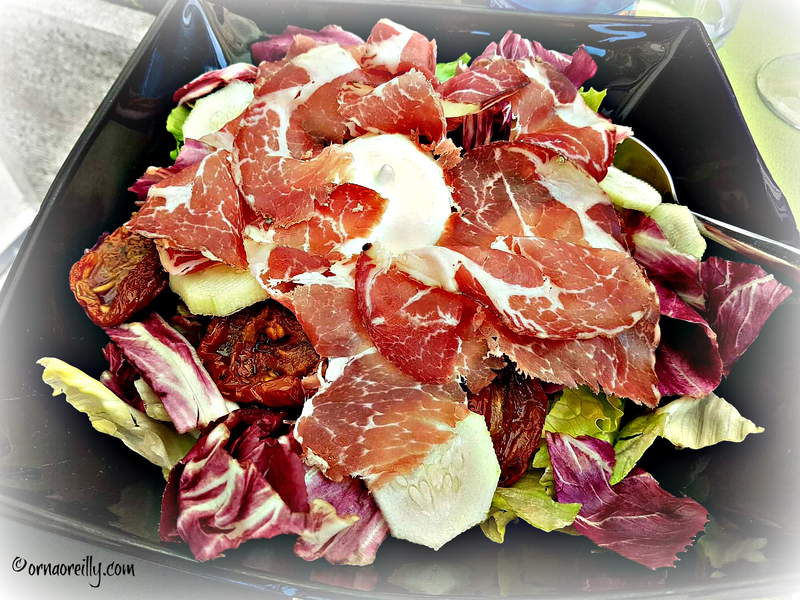 Along the coast, they mostly serve fish, while up here in the hills it’s mainly meat, as the area around the highest town on the Murgia Plateau, Martina Franca, is famous for its meat, in particular its capocollo – cured neck of pork which is served in thin slices. Down south here in Puglia, the local inhabitants are exceptionally friendly. We have made lots of new friends, both expat and local. 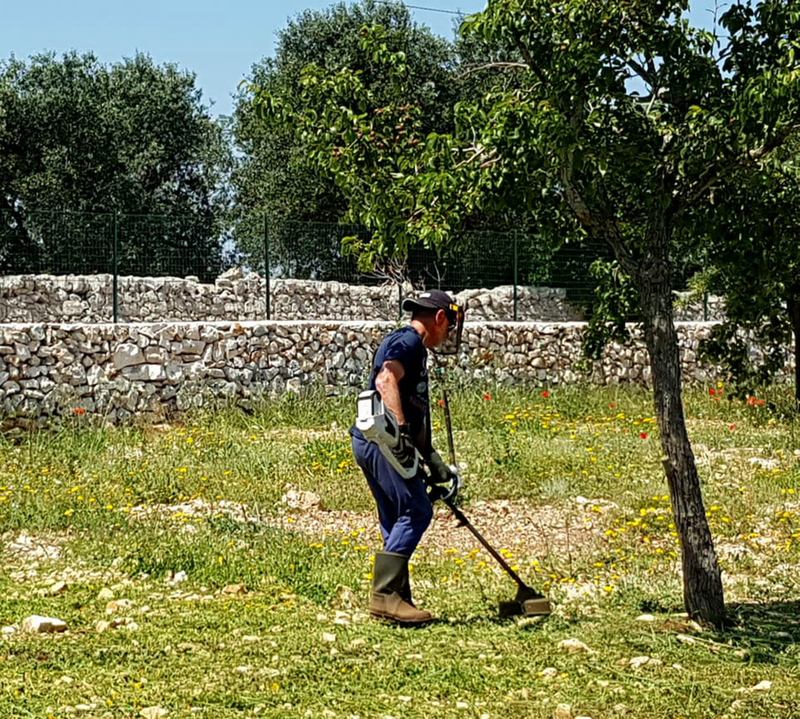 The full-time expat community, who have chosen to live out here in the campagna, have been incredibly friendly and helpful while we struggled to find out how to do everything that was so new to us, from dustbin collections to postal deliveries. We have been extremely lucky with our new neighbours and regularly share aperitivi and lively dinners together. Tom has been quite the hero as he struggles with the ongoing maintenance, including his pet hate: strimming weeds. A great deal of gardening – planting, pruning, irrigating – has proven necessary and all the arduous physical chores are brand new to him and his previously computer-bound self. Expecting a relaxing retirement, he is, on the contrary, developing new muscles with all this physical labour and has had to emerge, albeit mostly under protest, from behind his computer lurking in the depths of his man cave. For my part, this year saw some problems with my lower back and I found myself having to search for a good neurosurgeon. I was lucky enough to find an excellent one who works out of a reputable private clinic in Taranto. I am now well on the mend and am back to walking again – though steep hills and steps are still slightly problematic. I just have to be patient, as I sit comfortably on the veranda admiring my surroundings. I would like to wish you, all my loyal friends and followers, a very Happy Christmas and a wonderful 2019. How I enjoyed reading this account of your life in Puglia, Orna. I’d say you gift wrapped a pretty nice article with a bow on top. Great photos and a wonderful narrative. Merry XMAS and a Happy New Year to you, too, Orna Gabriella. 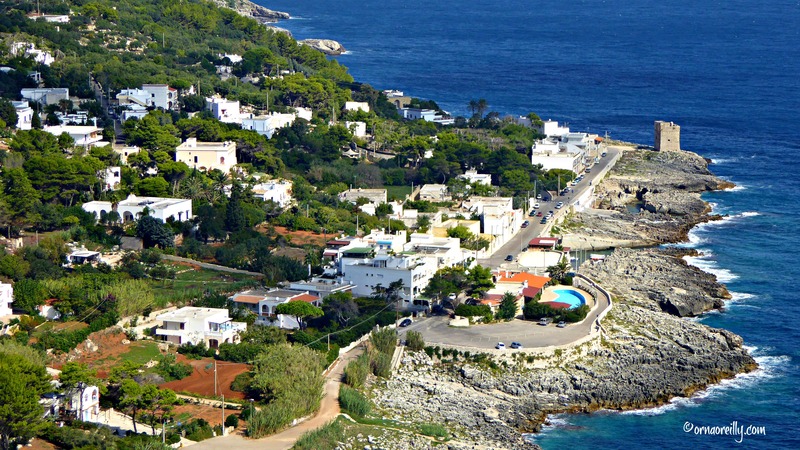 I’m going to refer to this lovely post next year when we plan to come to Puglia. We went there 10 years ago and loved some of Puglia, especially the food, which I think is some of the best in Italy. 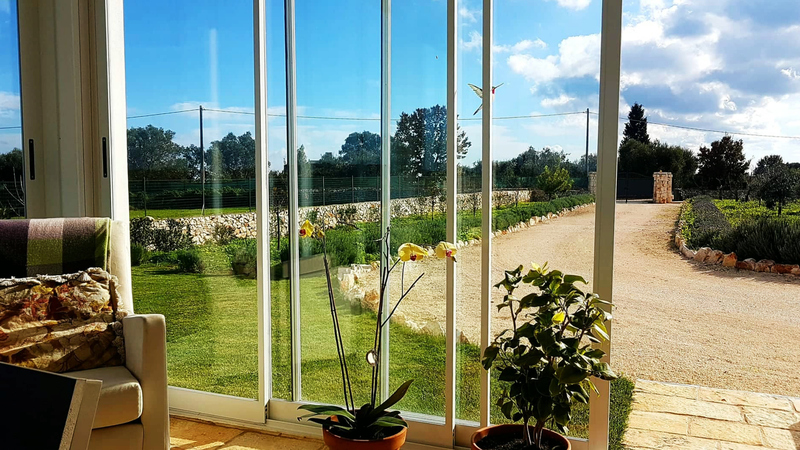 We are planning to stay at Il Frantoio near Ostuni again. We came upon it by chance last time. It was fabulous and we want to stay a bit longer next time and explore the area. Thank you for all you great suggestions. I hope you keep the muffa under control. We are beside a river in Bagni di Lucca and have a bit of a problem. Anti muffa paint helps a lot. Thank you Debra. Sorry for the tardy response, but we were visiting your other home, Australia. I have just begun to buckle down again and am busy writing a blog on the beautiful Sunshine Coast. No, it’s not Italy, but I am sure people will understand when they see the photos. 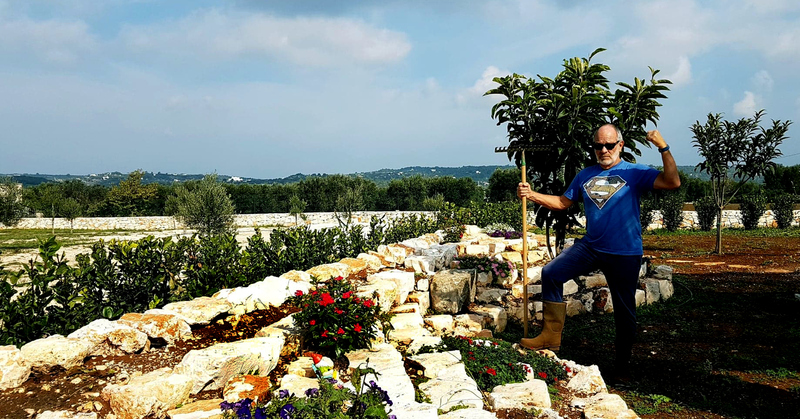 Il Frantoio is an excellent destination and if you are in Ostuni, please let me know. An appointment for aperitivi would be good! Happy New Year. Sounds positively idyllic, except for a little muffa and the problems you’ve had with your back. But I’m glad to hear you’re on the mend and wish you all the best for a Buon Natale and a Buon Anno with more wonderful things in store for you both in your beautiful home! You’re readers eagerly await the next installment. Thanks Karen. Sorry to only comment now in January, but we were extremely busy having a brilliant holiday in Australia over Christmas and the New Year. Happy New Year to you too. Hope you make it to Puglia this year. Hi Martin. Yes, it has been an uphill battle for poor Tom. However, his new set of biceps are a great consolation. Good luck with the gardening and all the equipment that it requires! Happy New Year to you! I just read your blog and I enjoyed it very much. it really made me think about my future life in Italy. My wife would love to get a place near the coast, because we live close to the sea here in Australia. I will appreciate if you could give me some ideas where to buy, if you have the time, of course. Happy New Year 2019. Thank you so much for the quick reply. Well, next time in Italy, I will try to visit all these places you’ve mentioned and see how they connect to what we would like to experience in a near future. Once again many thanks, I appreciate your time and suggestions. I’ve just discovered your blog 🙂 A question. I am considering a purchase in Puglia. Is dampness a problem in all the star vaulted houses? They are beautiful but I see the tell tale signs of white crystals and discolouration in many photos. Is the dampness caused by air humidity, rising damp, or a combination of both? Also, do houses with central heating have less of a problem? I’ve restored houses in France and Spain and am acquainted with the problems of stone and damp. A final question. Is the local limestone soft or hard? One of my houses in France had a vaulted kitchen and lounge ,and every day I had to clear fine stone dust from the floor and furnishings. I look forward to hearing from you. Hi Orna, Many thanks. I was actually referring to star vaulted houses. I know the problems with Trulli and would not consider buying one. My next step is to visit. Grazie mille.